Wedding celebration requires certain financial, physical, emotional costs. Is it possible to hold a wedding independently and inexpensively, so that everyone likes it? Background: A few days before the New Year, my son called and said that I would soon be a grandmother, and then I bided good night. As you understand, I could not get enough sleep, first from surprise, and then from thoughts "How is it to organize the triumph with the least loss", I.e., inexpensively. Since it is possible to organize a wedding independently and inexpensively independently and inexpensively? Let's consider how you can stage a wedding celebration yourself. Let's start with the appearance of the newlyweds. But how is it possible to save on the vestments of the newlyweds? Hairstyle, make-up and manicure is best done by yourself, so there will be fewer surprises on such a solemn day, and much more economically. The most economical thing is to make rings of unnecessary, obsolete gold items. As an option, jewelry stores offer the exchange of scrap precious metal for finished products with surcharge. The biggest expense item, as it turned out, is the order of the banquet hall. On products it is difficult to save, because quality goods are always in price. What to do? A cake can be prepared by a mother or grandmotherFavorite recipe, and from the top cover it with mastic, video-like teeming with the Internet. In the extreme case, instead of a cake, guests can be offered cakes, for example, meringues. They will cost inexpensively. Dessert we calculate approximately 150 grams per guest. Registration of the banquet hall is realisticOf course, with the help of friends and relatives. 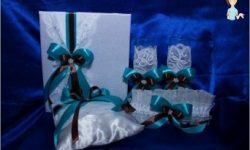 Guests will be pleased to see their name on the festive table, for this you can use small boxes with gifts and the name of the invited, who will also serve as landing cards. On the tablecloths elegantly looks tulle, picked up in several places. 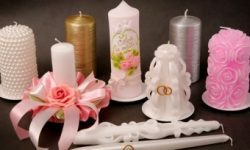 Perfectly complement the table setting with a bouquet of artificial flowers with candles. Fire cleans space and promotes communication. A money chest with a slot or hingedIt is easy to make from a cardboard box, pasting it with wallpaper, or cloth, decorating with flowers, tapes following the general style of the room. How to do it right, you can look at special sites. How much will it cost to rent a car and decorate a wedding cortege? The car for the newlyweds is on average2000-4000 rub. in a day. It will be cheaper to order it for several hours. And you can ask a guest with a nice car about the service. With this option, it is assumed that only fuel is spent. For guests without personal transport, you have to book a minibus for several hours. And this additional - 1500-3000 rubles. If you are tired of the same type of festive competitions,Offered by the toastmaster, you have the opportunity to try yourself in the role of an organizer of entertainment rooms. The task will help the Druze, friends and relatives alleviate the problem. 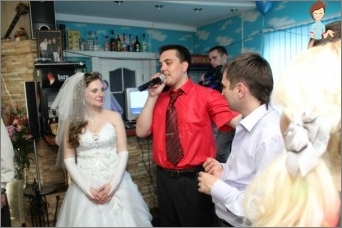 The global network offers a lot of examples of scenarios and video of weddings. Preliminary carefully thought out each contest, entrust your "Co-producers"Hold them. And do not forget to buy or make prizes. In the evening, prepare (wash and iron) clothes in which they intend to go to the registry office. On the appointed day, the groom buys a bouquet of flowers, takes rings with him, calls at his bride, together they marry off to marry. After it would be appropriate to go to nature, ride a yacht, go to the skating rink, jump on the trampoline and make fun selfie smiles, legs, ringed hands. To finish this significant day it is desirable to have dinner with candles, for example, on the roof of a high-rise building, on the bank of a reservoir, on a river tram - here the flight of fantasy is unlimited! How to organize such a wedding yourself and do everything correctly tells the Internet. The network has a lot of useful tips. We offer one of the options. After the ceremony of bride price, weddingThe procession, having made an honorable circle on the chosen places of the city, leaves on the prepared platform for a celebration, somewhere in the forest zone of the suburb, on the shore of a lake or river. There will be a harmonious look registration under the arch of flowers. Plastic chairs and tables should preferably be decorated with a cloth with bows. Young can release pigeons into the sky, airBalls, ride a boat, light a large fire, dance around him or dance an Aboriginal dance, organize horseback riding. Instead of competitions, offer competitions: Tug of war, orientation on the terrain - to hide some object, and through riddles and riddles give the task to find it, for example, a trunk for money, and then begin the procedure of presenting gifts. Impressions and photos will remain unforgettable. A romantic ending of the holiday will be the launching into the sky of Chinese lanterns or the launching of lighted candles on the water. The main thing is that in this variant, so that the weather does not fail, make an agreement in advance with the "Heavenly Chancellery". 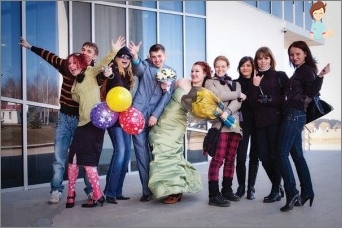 A celebration without a banquet is an excellent way of organizing a small youth wedding on your own. After the ceremony of painting with relatives, the youth company can go to the entertainment center, the roller center, to the ice rink, usually for the convenience of visitors such establishments have cafeterias and pizzerias. A small wedding can be arranged at home. To hold a banquet at home, especially in an apartment, it is appropriate to invite no more than 10-20 guests. This option allows you to include in the plan of entertainment events competitions, creative tasks, riddles about each guest. 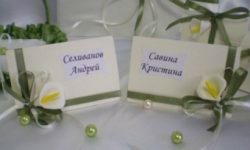 It will be interesting for everyone, for example, to watch a slideshow of relatives, starting with black and white photographs of great-grandmothers and great-grandfathers, ending with vignettes of newlyweds from the graduation ball. This is one of the options for how you can organize a wedding yourself without resorting to the help of parents. How can a poor student get married if the scholarship ends in a few days? It is clear that you can not dream of dresses, rings, limousines, banquets and other wedding attributes. But how to conduct a creative, unusual holiday in the student's style? Voyage on an electric train on a student card inThe regional city, where a holiday or entertainment show is held, will be an unforgettable adventure, and the collective distribution of flyers will help to make money on the road. The main thing is to be unusual, exciting and fun! Such a holiday will not be forgotten, even if only by its unusualness and originality. In any case, setting priorities, remember: the cost of the celebration does not guarantee a happy family life. But most importantly: Love yourself, choose what you like (this is your holiday), take care of your strength, nerves and time, they will be so useful to you after the wedding. Happy family life to you! Love and be loved!